You’ve got your eye on the prize, and we want to help you get there. We are excited, and humbled, that you are considering continuing your degree at St. Mary’s. First things first. If you haven’t already, please submit this form to begin a relationship with St. Mary’s and we’ll be sure to share information with you about our academic programs and community that you haven’t even thought to ask. Our SAT code is 6637; the ACT code is 4158. We encourage you to submit all SAT and/or ACT results; we’ll use your best subscores across all test dates. Since we run on a rolling admission platform, we accept applications until a few weeks before the academic term begins each semester. Apply by June 1 for priority consideration for admission and transfer scholarship opportunities if you intend to enroll for the fall semester. And review important dates for the application and enrollment process to ensure you optimize your opportunities for admission and scholarships. The Office of Admission works in conjunction with the Registrar’s office to make sure you know which credits will transfer and how they will support your degree plan at St. Mary’s University. Transcript articulations are completed after the student is accepted to St. Mary’s University and can be reviewed by accepted students in Gateway, the portal for St. Mary’s University. Until then, the University is pleased to offer the St. Mary’s University Transfer Equivalency Self-Service tool to prospective students to view how academic coursework earned at other institutions can be used at St. Mary’s. All you have to do is enter the classes and the institution where you took the classes and the system will show you a sample articulation report, a degree audit and even next step options—even before you apply for admission. St. Mary’s University has a rolling admission policy. However, priority is given to students who complete the application procedures in a timely manner. Apply early and remember these dates. Submit the Application for Undergraduate Admission and Scholarship by this day to receive priority consideration for St. Mary’s transfer scholarships. We recommend applying by this date in order to complete the application process in time to enroll for the fall term. We know that each college or university has a unique process for applying and evaluating transfer credit. 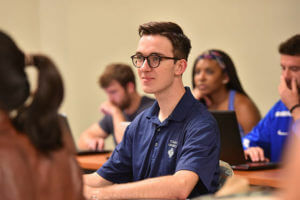 We have a talented team of counselors to answer any questions you may have about or many academic and co-curricular offerings and how your academic preparation elsewhere will lead to a successful career at St. Mary’s. You can contact us at 210-436-3126 or uadm@stmarytx.edu. We look forward to hearing from you.